The built-in sonar capabilities of the GPSMAP 7407xsv include 1 kW dual CHIRP sonar, the most sophisticated sonar technology available for the fishing and boating public. Dual CHIRP sonar provides amazingly clear target separation and definition because it puts even more energy onto the target than CHIRP. It gives you the ability to show low/high, med/high or low/med on the screen at the same time, enhancing your ability to distinguish between game fish and balls of bait fish. It also includes both CHIRP DownVü and CHIRP SideVü scanning sonar that provide nearly photographic sonar images of fish and structure that passes below and to the sides of your boat. Garmin DownVü™ and Garmin SideVü™ provide the clearest scanning sonar images on the water. Also supported are 50 kHz/200 kHz, 77 kHz/200 kHz and Minn Kota® and MotorGuide® trolling motor transducers (sold separately). GPSMAP also includes sonar-recording capability that coordinates the timing of the sonar return with your boat's position and saves digital information for playback on a computer using HomePort™ planning software. Two microSD card slots provide expandable memory for accessory map purchases, such as LakeVü HD, LakeVü HD Ultra or BlueChart g2 or BlueChart g2 Vision. Built-in Wi-Fi/ANT for use with Garmin Helm and BlueChart Mobile. Better still, with enhanced Version 2.0, you now have access to even more features and capabilities. You’re able to adjust the calculated Auto Guidance pathway by inserting “via” points at interim stops or landmarks along your desired route. You can easily review hazard points along your calculated path. And you can even engage your compatible Garmin autopilot to follow the Auto Guidance route, automatically. Other 2.0 enhancements give you the ability to calculate arrival times at any point on your route (great for timing arrivals to correspond with bridge openings and other time-critical events). Better still, you can now save your plotted Auto Guidance paths for future navigation by backing them up on an SD card with your BlueChart g2 Vision or Garmin LakeVü HD Ultra cartography¹. 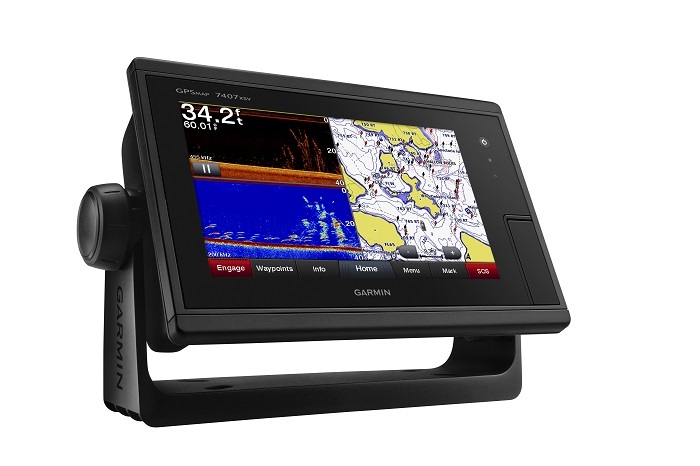 This chartplotter supports wireless connections to Garmin VIRB X and XE action cameras so you can catch all the action during your time on the water. More importantly, with a simple software update, you can control recordings, take still pictures, and stream video from a VIRB X/XE action camera to your GPSMAP 7400/7600 series chartplotter or 8000/8400/8600 series Glass Helm chartplotter. In fact, you can stream video from up to 4 VIRB X/XE action cameras and view the video on a compatible marine chartplotter. You can even view previously captured images and videos on the chartplotter and display thumbnail previews for easy selection. Control play, pause, seek and replay from your chartplotter. There’s even an automatic slide show mode and the ability to delete unwanted VIRB images or videos. Each VIRB can be named for easy identification. You can also control your VIRB cameras to change VIRB video settings, including aspect ratio, video resolution, frames per second, photo size, field of view and more — directly from the marine chartplotter. Send NMEA 2000 boat information from the chartplotter to VIRB X/XE to be overlaid as G-Metrix data on the video using VIRB Edit or the VIRB mobile app. Some data requires optional accessories.